Gas Leaks are caused by wear and tear with fittings that either leak underground, in walls and below a structure or appliances that have been incorrectly installed and poorly maintained. Gas leaks are not something you should take lightly. A gas leak is an unexpected release of gas creating a dangerous situation because gas is poisonous and harmful. The smallest of leaks can accumulate and ignite to cause an explosion. Natural gas, or methane, is widely used in homes for heating and cooking. It is not poisonous, but it displaces levels of oxygen that can result in death. Every year, tragedies occur from asphyxiation, but a gas-filled basement can explode into a devastating fire that can consume the entire house. Natural gas leaks are dangerous because methane gas is highly combustible. 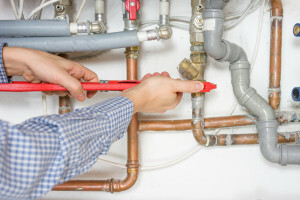 Rodger’s Plumbing uses state of the art equipment to help locate the source of a gas leak to repair it. Gas leaks are not something to take lightly. There is a slight risk with a small leak that it can build up enough to cause an explosion. Your sense of smell is the strongest to help with a natural gas leak since it is colorless, tasteless, and nonirritating. At Rodger’s Plumbing we have over 46 years of experience providing gas leak services throughout Dallas. Get the benefit of our many years experience by calling us now at (972) 931-1021. Many leaks are caused by damage to pipelines, and this can happen by accidentally striking an underground gas line while digging. Plan before you dig to ensure that no pipes will be disturbed and cause danger to you and your family. Call the professionals at Rodger’s Plumbing. We understand that your family’s safety is important to you, so do not put them or yourself at risk if you suspect there is a natural gas leak. If you live in the Dallas, TX area and are looking for gas leak help, call Rodger’s Plumbing at (972) 931-1021. The plumbers at Rodger’s Plumbing can help you in a natural gas leak emergency. Areas we provide gas leak plumbing services to include: Frisco, Hebron, Mckinney, North Irving, North Mesquite, Rowlett, Murphy, Wylie, Sachse, Garland, Allen, North Dallas, Richardson, Plano, Carrollton, Addison, Farmers Branch, Coppell, Highland Park, and University Park.